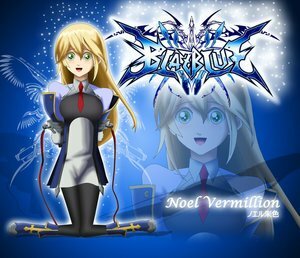 Noel Vermillion is the main heroine of the Blazblue Series . She is a young girl who was adopted into the Vermillion's family after being rescued in the burning fields of Ikaruga. She later becomes an important member of NOL because of her outstanding ability in using the Nox Nyctores revolver. Apparently, this revolver does not fire real bullets but it is just used to cause damage in dimensional space. Noel also extremely depends on her arms. In fact, she will literary breakdown if someone take them away from her. NOL made her the subordinate of Jin. However, Jin does not treat her well because she resembled Saya, his sister. When Jin left his post to hunt down Ragna, NOL assigned Noel the duty of stopping him and bring him back to the library where his post was. The reality is that Noel is suffering from Mu-12 Amnesia, which is the precursor of Nu-13 and a final superior in the Continuum shift's console version. Mutually, they are Saya's replica, sharing her face, her voice, and even memories. Noel was being engaged in the boundary as the story begins. However, after the Ikaruga Civil war, she remains the only survivor in the area. In the long run, she becomes the true owner of the Azure Grimoire. She has a tender heart and is easily won over by animals that are small in size and cute in appearance. In addition to that, she feels inferior with her breast. In the continuum shift, Noel begins to stay with Ragna, who cares for her more like his sister Saya. When she realized that Jin Kisaragi had left hospital, she leaves to find him. After being saved by Ragna at the of the end continuum shift, she leaves to Ikaruga with Iron Tager and Mokoto. 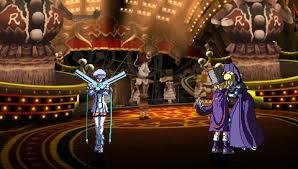 In the Chrono Phantasma, Noel alongside Kagura, Jin, Ragna and other members join forces against the Imperator. With Rachel's assistance, she controls her amnesia. As such, she saves Tsubaki from the Imperator. The story ends when she and Jin are injured.